My family was like anyone else's family with all the usual laughs and pitfalls that happen to us all. Until that is, one dark day Meningitis swept through our door with menacing efficiency taking with it the life of my only son Lee. 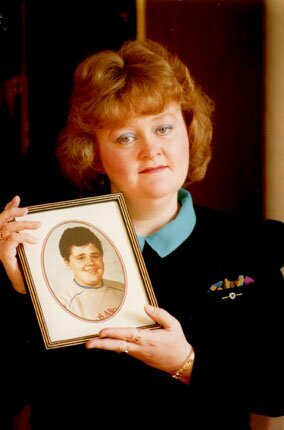 Lee was almost 18 years old and he was taken ill in the ambulance taking his grandmother to the St. Margaret's Hospice in Clydebank, so ill was he that he could not wait until she was settled but insisted on being taken home immediately. The doctor was called in and diagnosed gastro-enteritis and told us to keep Lee in bed and give him liquids. This we did, however, in the morning his condition had deteriorated so much that he was purple, and blue, hallucinating, sweating buckets. The emergency doctor was called and immediately called an ambulance to take Lee to Ruchill Hospital, however, his condition deteriorated so swiftly that Lee died in the ambulance on the way to hospital. The problem with many cases of meningitis is that it is so very difficult to diagnose until it is in some cases too late. Our son was a fit, healthy young manwhom we always joked that germs would be afraid to go near him as he had never had a days illness in his life, but we were so very wrong. Meningitis brought him down in just a few hours. You are in a state of complete and utter shock, and you think that if someone pinches you, you will happily wake up and find that you have been dreaming. Not so, it is all so dreadfully real and you have to face up to reality that your only beloved son is no more. No more will you hear the cry, "Mum, I'm home", when he comes home from work, or the inevitable call Mum, I'm hungry". Now only silence permeates the house, and all you have left is treasured memories. Prior to these distressing events, meningitis was just a word that you might hear on a television news bulletin, or you read about in a case in the morning newspaper. It does not concern you, so you pay no attention, until the day dawns and it comes sweeping through your own door and makes you sit up and take notice. The dreadfull part of it all was that no one gave us any information. We were left completely in the dark and just had to pick up the pieces of our shattered lives and get on with it. I was told, " ... there was not one ... ". There are so many unanswered questions such as "Why was my son affected and no one else's ? could we have done anything to prevent it ? ", so many questions and no answers. Lee was almost 18 years old when he died in October 1990. He would have been eighteen in the November of that year. 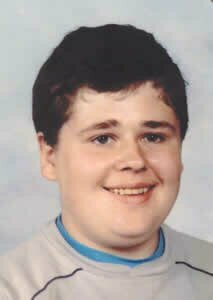 When i read a small snippet in the local newspaper of a donation of £10 to meningitis research by the family, i thought that this was an excellent idea, and we could give the money we would have given to Lee for his birthday to research instead. The only telephone number i could get was that of the National Meningitis Trust in Stroud. when i asked where their local Scottish Office was, i was told there was not one ! The only contact in Scotland for information or anything else at that time was one support group in Saltcoats, which is still up and running and still going strong to date. At this point i decided that something more had to be done and that this situation was not good enough. If we did not know anything about meningitis, how many other families were out there as well with the same questions ? So i started a support group in the Glasgow area which met for the first Time on the 11th March 1991. Subsequent to several group meetings, it was decided to obtain our own Charity status as we had been aware of several doctors and physicians working here in Scotland who desperately needed funding generated by our members. 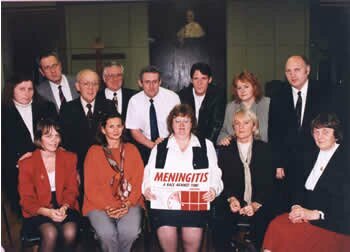 The Meningitis Association of Scotland was born, the first registered charity in Scotland for meningitis. We continue to support families who have had a member affected by meningitis, not only the bereaved, but the survivors for whom there is very little help or support. We attempt to help them as well. More and more information is now coming to hand and the various research labortories here in Scotland are making progress all the time. They are working around the clock trying to find answers to so many questions. We provide literature to try to inform people and try to dispel some of the myths that surround meningitis today. This work is cost effective and time consuming. It requires substantial funding to keep them going. Everyone wants answers, but it seems few are willing to fund them. We in the Association cannot bring our sons and daughters, but we can and will attempt to save other families from going through the anguish and agony we have. We will continue our efforts, however small, to make sure that eventually meningitis is eradicated completely. Please be aware of the signs and symptoms of meningitis as who knows the next life saved might just be your own.